Bring closed toed shoes and your balance if you are interested in taking the off beaten path to visit a company that builds large-scale handmade fishing boats. No, you won’t climb the boats in construction. You may, however, get to climb a wobbly wooden plank up to a fully constructed boat if there’s one docked during your visit. There are several superstitions in Vietnamese boat culture that especially restricts women from climbing or sitting on boats in construction. It is understood that should a woman sit on a boat before it is completely built, the boat will be forever cursed with bad luck. 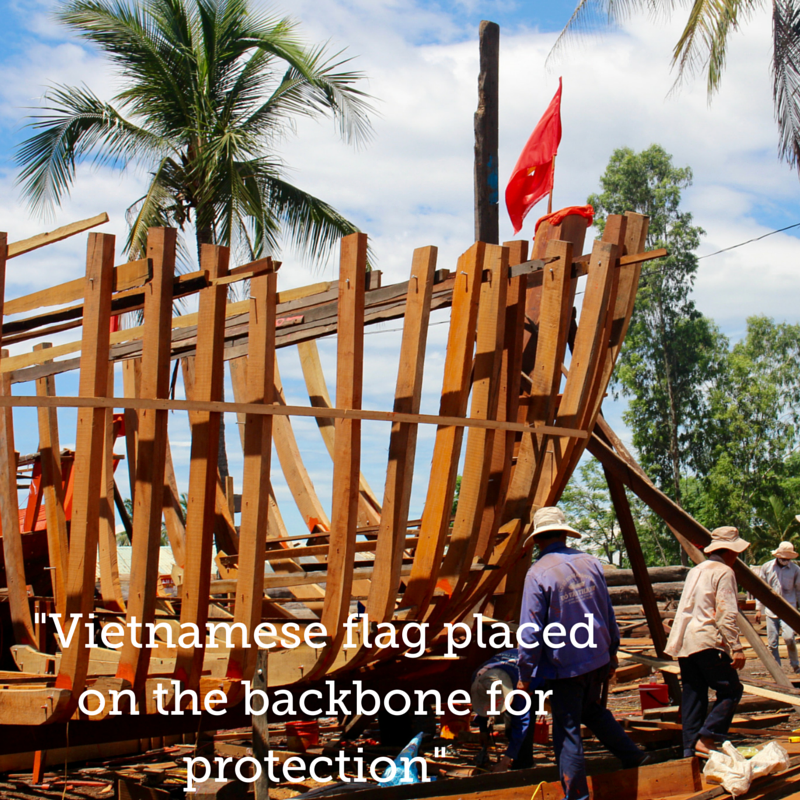 Similarly, during construction, a Vietnamese flag is placed at the backbone of the boat for protection and good luck. As with the start of most businesses in Vietnam, the business owner, or the captain in this case, must visit the fortune teller for good luck in his/her endeavors. Although not seen on the front of these large-scale fishing boats, the smaller boats along the river in Hoi An have eyes painted along the front of the port and starboard side. It is understood that these eyes can see the way the engine should go, which ensures all aboard will be safe and protected in their journey. The Vietnamese fishing boats are made of teak trees, a hardwood grown in tropical regions. 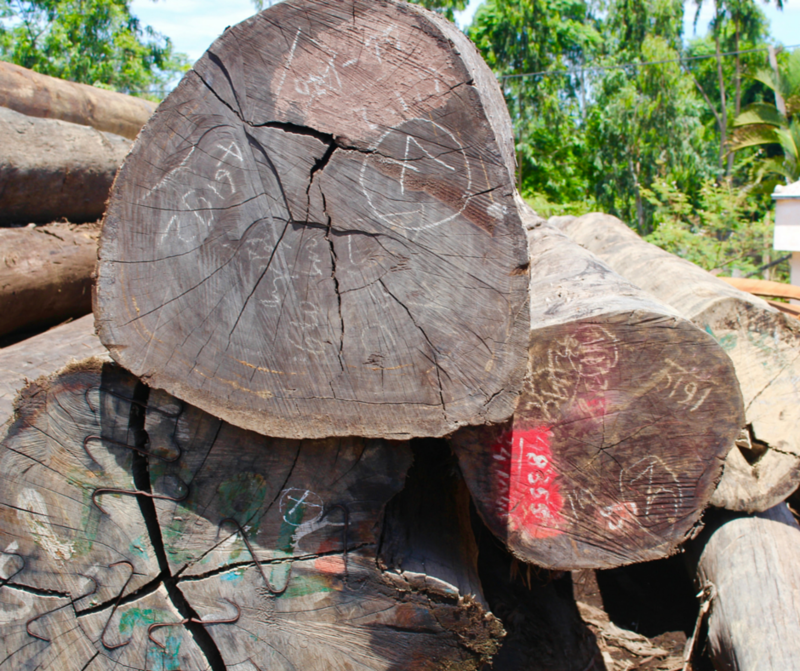 These teak trees are processed and turned to lumber in the sawmills. 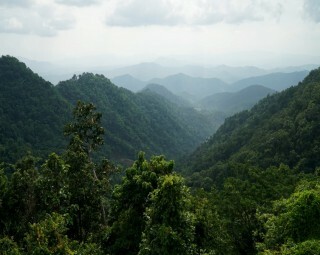 Illegal logging is a serious problem in Vietnam because of the short term benefits, with a disregard for the long-term consequences on the environment and surrounding communities. The loggers must therefore carry a government permit when they transport the trees to this facility. After the teak is processed, the wood is placed in the water, making it softer, and therefore easier to burn and bend. Thanh, shown above, is a partner in this family owned boat building business that has grown considerably since it’s opening in 1995. 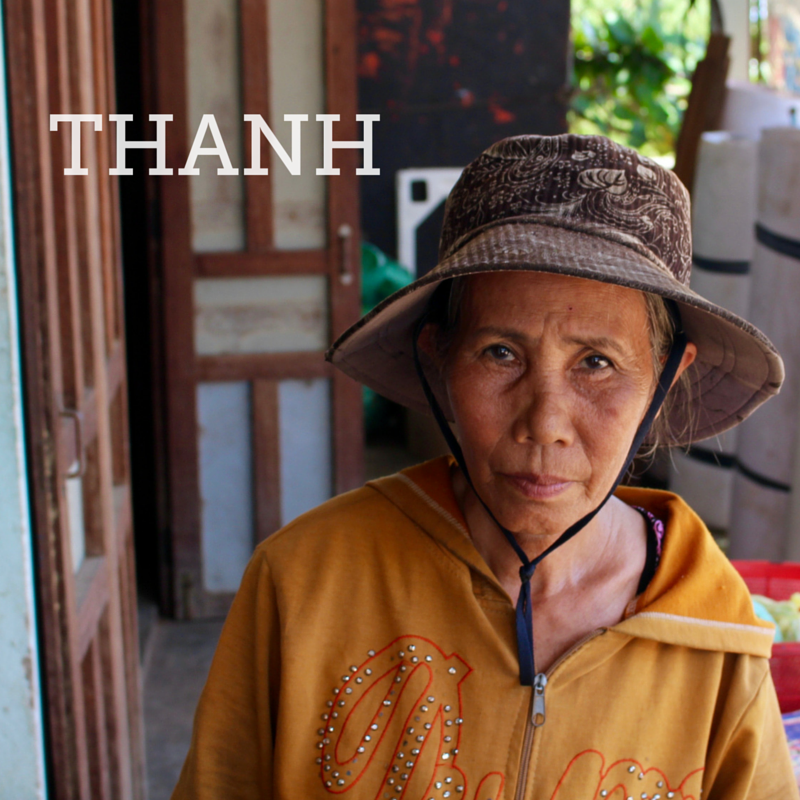 Prior to 1995, Thanh explained that her family was very poor. Thanh’s husband worked for a boat building business much like this one outside of Hoi An, and after it’s closing he was inspired to open his own business. In the first few years, business was slow, and the company had only a couple of orders. However, as of 2015, their most successful year yet, there were 17 large-scale fishing boats constructed. 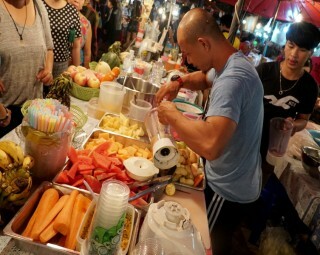 Thanh considers a low production year when the company has around 8 orders. 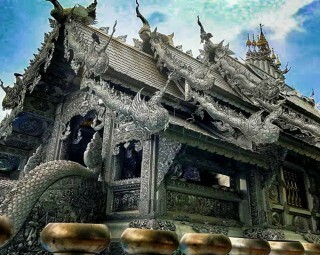 Although the company predominantly builds fishing boats, their range has significantly widened, as they have had orders to make Vietnamese government boats, as well as large scale tourism boats. A boat is not cheap. They cost on average $120,000 US dollars, plus another $60,000 for machinery and production costs, which totals to $180,000 US dollars. Hours are long, and conditions are harsh, especially in June and July where an average summer day reaches 32 degrees Celsius (90 degrees Fahrenheit) with a constantly beaming sun. 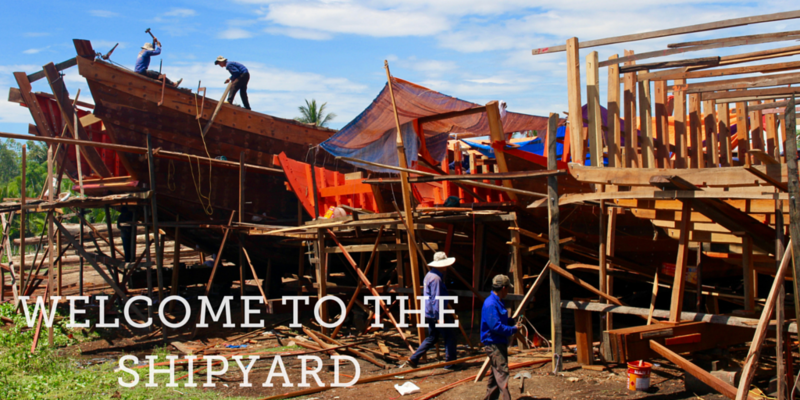 The boat builders arrive at the shipyard at 6:30 AM six days a week, and work until a tea break at 11:00 AM. The workers return after lunch around 1:30 PM. In Hoi An, there is essentially a “siesta” break in the mid afternoon where people return to their homes for some rest and relaxation. These boat builders then return to the shipyard, and finish their day at 5:30 PM. The captain is given the money for a day’s work, which he allocates to the workers. 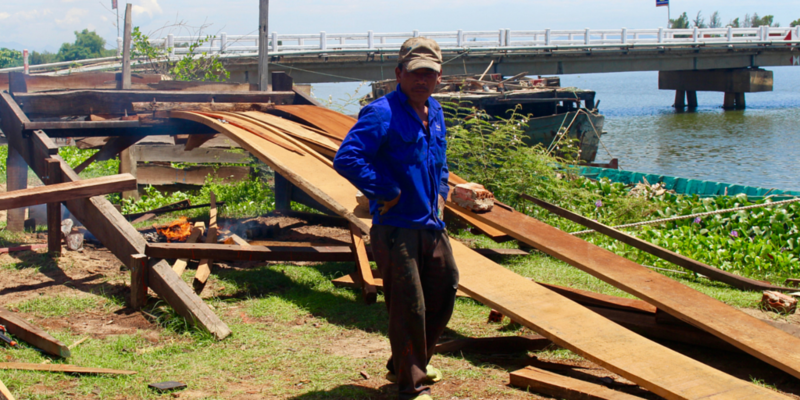 Unless the boat builders work overtime, they earn $17 dollars per day. 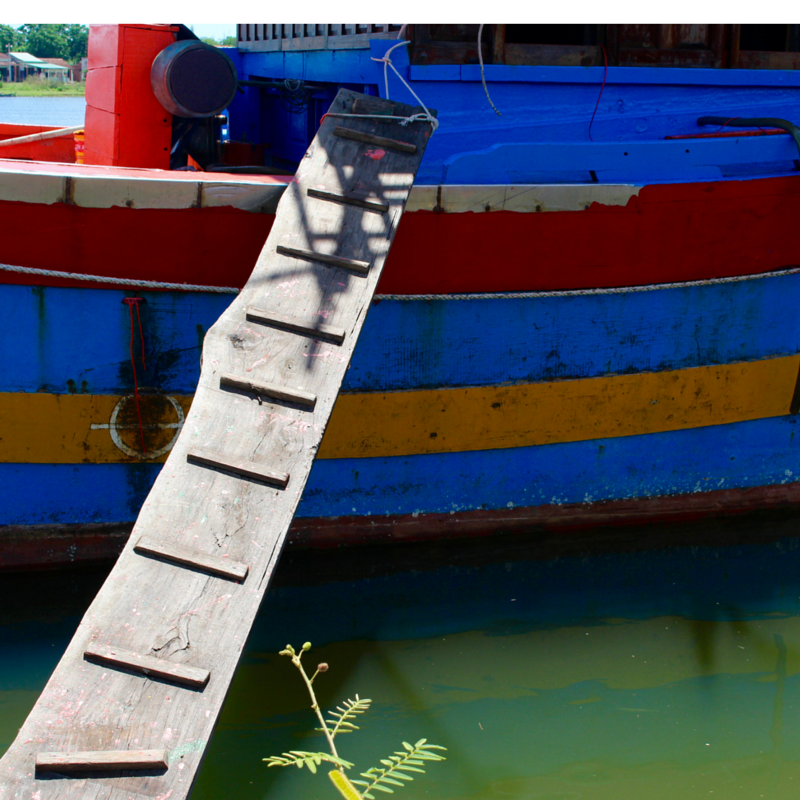 A bright red, yellow, and blue boat was docked at the shipyard today, and I was fortunate to climb aboard. The wooden plank is as unstable as it looks, so I recommend you hand your camera off to someone on either end of the obstacle. I conquered the plank; however, falling in on this piercing hot day wouldn’t have been the worst thing in the world. I explored the boat, which had small sleeping quarters, a deck, and bright blue barrels along the sides that, while at sea, would be filled with salt water to keep the fish fresh once they are caught. These fishermen spend long and strenuous months at sea on these boats, thus after seeing how much work goes into the job and the journey, I can understand why the fisherman won’t head to sea without an abundance of rice wine provided by the captain. This day time tour of Hoi An ended with a delicious Vietnamese meal overlooking a river filled with small fishing boats. We were comforted by a light breeze and a bamboo covering to protect us from the radiant sun. This is a Hoi An must see if you’re interested in taking an adventure, all while learning about an intricate craft and meeting several hard-working and warm-hearted people along the way.